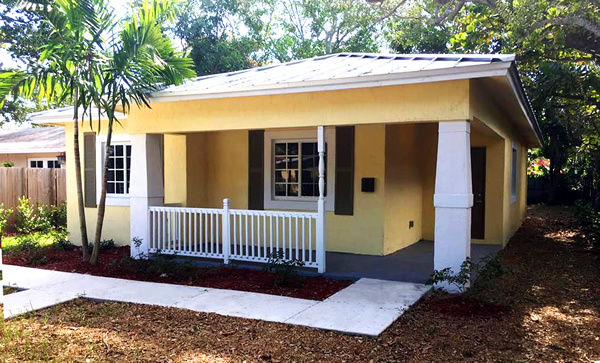 NHSSF completed Village West Homes, a 6-home scattered site initiative located in historic West Grove of Miami’s Coconut Grove. These affordable new homes feature Bahamian architectural style in keeping with the neighborhood’s heritage, and many energy efficient components such as impact resistant windows and doors, high efficiency HVAC system and appliances, full sized washer and dryer, metal roof, and tile floors throughout. Covered front and back porches, all wood cabinets and landscaped lots make these homes a tremendous value. 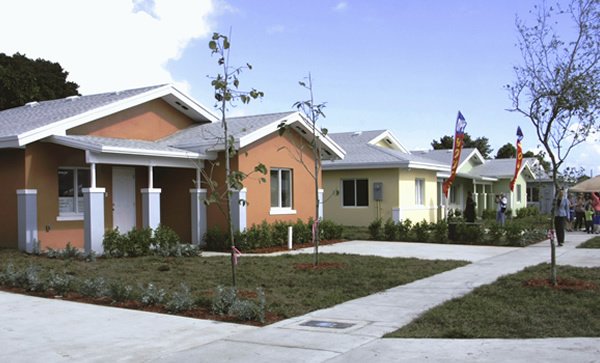 NHSSF developed 8 new homes on scattered sites through north and central Miami Dade. Two general contractors are in the process of completing these homes, slated for completion in late 2016. Each home includes impact resistant windows and doors, low VOC paints, tile floors, all wood cabinets, complete appliance package including full size washer and dryer, high efficiency HVAC system and appliances, granite kitchen countertops, low flow plumbing fixtures, low maintenance landscaping and numerous other desirable home details. DuPuis Pointe: 27 single family homes of 4 bed/2 bath and 3 bed/2 bath model homes completed in 2013. 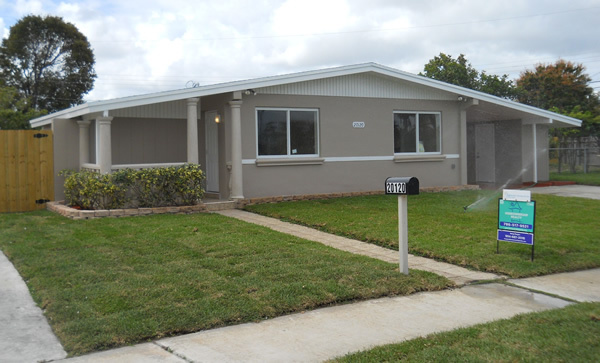 Located in northwest Miami Dade County, just north of Brownsville, one of Miami’s oldest neighbors, DuPuis Pointe was a breakthrough new community of smart design and energy efficient residences in an area with housing stock that dated back to 1940s and where no new homes had been constructed in the prior 10 years. 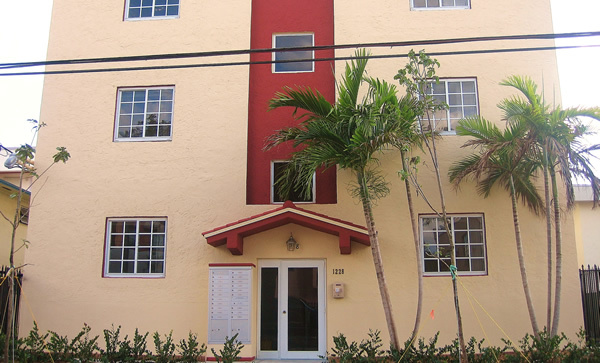 Rio Palma: 18 unit 3-story apartment in the heart of Miami’s Little Havana area, underwent a complete modernization in 2012. Since renovation, the building has been in use for affordable rentals and has enjoyed robust high occupancy. The property is currently listed for sale. 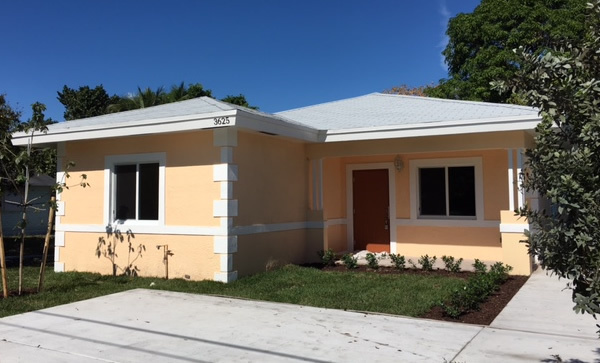 NSP Activities: Through NSP2 funding in 2011, NHSSF acquired, renovated and sold more than 35 single family homes in northern Miami Dade County. Additionally, as a member of BAND’s development team, more than 150 homes were acquired, renovated and sold in Broward County through funding from NSP1 and NSP3 programs. Along with the above projects, since 2005, NHSSF has developed and sold more than 18 homes in Miami-Dade and Broward Counties. New Development opportunities: Our Development team seeks viable homeownership projects of 8-20 sites in central and north Miami Dade-County and through Broward County. For further discussion about partnership or joint ventures with NHSSF Real Estate Development, please contact our Development Director. Neighborhood Housing Services of South Florida does business in accordance with the Federal Fair Housing Law and Equal Credit Opportunity Act.